As with their EF-S counterparts, the EF-M series are designed for the smaller APS-C image circle and for the EOS M series bodies in particular. 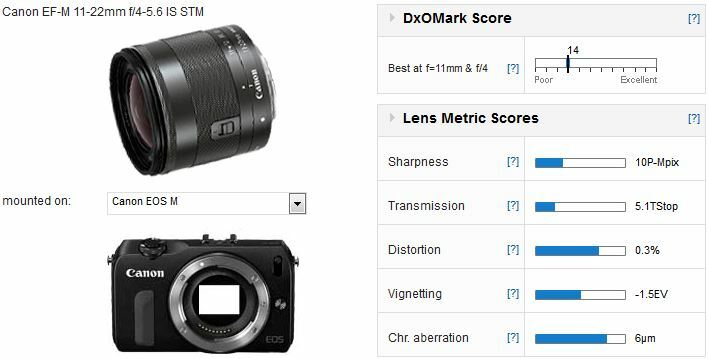 This is limited to just one model presently, which takes its name from the system, the 18-MPix EOS M.
Introduced earlier this year this new wide-angle zoom lens is the equivalent to a 18-35mm field of view and is equipped with both a 3-stop “Dynamic” stabilizer built-in and the firm’s new linear stepper motor technology for less intrusive focusing with contrast detection AF during video-capture. It also features a full-time manual focus option and a new retracting mechanism (and lock) for improved portability. As for the optical construction, it has 12 elements in 9 groups, focuses to just 15cm and weighs 220g. The lens hasn’t officially been released in the US, but it is available now in Europe at 406,50 Euro (around $449 after deducting sales Tax). On the EOS M the 11-22mm is a good all-round performer, achieving a respectable DxOMark score of 14 points while also attaining a good sharpness score for an ultra wide angle zoom of 10P-Mpix. Distortion and more troublesome lateral chromatic aberration are very low, the latter is negligible while the former (barrel distortion) is really only noticeable at 11mm. Vignetting at -1.5EV is well controlled for a lens of this specification. 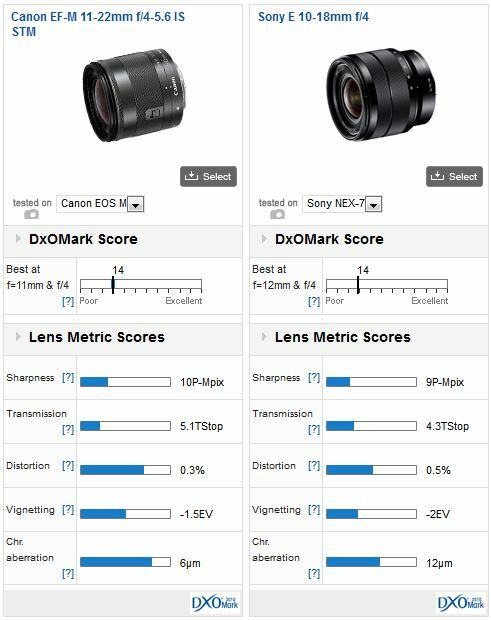 When compared with the constant aperture Sony E 10-18mm (equivalent to a extremely handy 15-27mm) f/4 OSS mounted on the 24-MPix NEX-7 the Canon achieves the same overall DxOMark rating of 14 points. However, the Canon is sharper and has better uniformity. Constant aperture lenses like the Sony are more suitable for video recording (avoiding the changes required to exposure during zooming), not only that it has better light gathering capabilities at the longer end, equating to close to +1EV. Given the extreme field of view of the Sony, it is perhaps unsurprising that the Canon has slightly lower levels of CA and vignetting. While the ultra-wide Sony is the more attractive proposition for it capabilities it is some $400 more expensive. 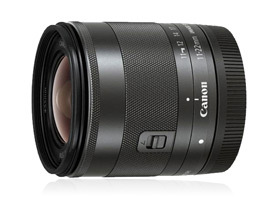 While Canon USA has not officially released this lens, it is widely available elsewhere and as the only ultra-wide zoom for the EOS M currently it’s an important model. It’s also a rather good performer optically and with both a linear AF motor and stabilization that’s particularly suited to video few could argue that this lens isn’t attractive option.